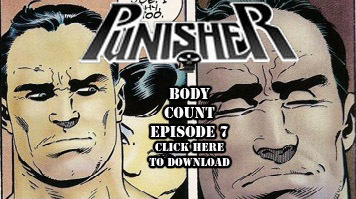 Welcome to Punisher: Body Count numero siento, where the content is hilarious and the points don’t matter. Within the first five minutes we have a very special announcement about a current guy working on Punisher right now, so stay tuned for that in the next episode! We go through Mail Call and Rapid Fire like a fierce gazelle and we head into Bullet Points with equal grace. There, we discuss mannish-looking women in Punisher MAX #3 and then discuss a villain that will surely not become part of Frank’s rogues gallery. Next, we discuss Return to Big Nothing in the Flashbacks section and things kind of fall apart from there. Listen, I’m not going to spoil anything for you, but you’ll either love our “discussion” or never listen to us again. Jake and I wrap things up in Discharge Papers by talking about a Tim Burton classic and I harp on about the DC reboot, which surely no other comic podcaster has done before. If you like, hit us up on iTunes or RSS.